Another year is winding down, and the generosity of Mikey, Pinky, Dave and guest Remodling Clay Shaver knows no ending. 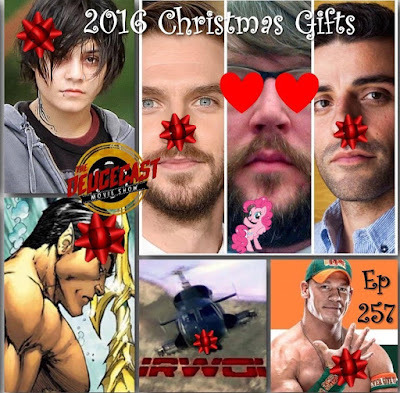 It's the annual episode where the hosts of the show (and guests) give out Christmas gifts to the celebrities and movie stars who need a little Christmas cheer. First up, Remodeling Clay, who's words will discount or qualify the validity of a song when it comes to the "Christmas" label, gives his take on a classic by The Eagles. The presents flow readily... gifts for Amy Adams... Bradley Cooper... Brendan Fraser... Kevin Hart... the cast of Ice Age... Marvel... John Cena... M Night Shymalan... even Vanessa Hudgens... and someone gives a gift to themselves, involving Dermot Mulrooney. Wait, Dylan McDermont. Wait, Dermot McDermot. Um... Dylan Muldermot? Well, crap. You know that guy. Thanks for a great year, thanks for listening, subscribing and being a Deucecast Movie Show Fan! !